I’ve got a bee in my bonnet I thought I’d shared today. I love getting endorsements for my books, and I love giving them. But the thing that bugs me; fake endorsement. Readers may stop trusting the endorser. Not what I want as a writer and blogger. It is acceptable among authors and publishers for writers to ask for an endorsement by sending a line or two they have written themselves. The celebrity, authority or author whose name appears on their book cover adds clout. So, they call or send a note. “I know you’re busy. You mentioned endorsing my upcoming book. To save you time I’ve written one for you. If you’re comfortable with the wording, may I add your name?” Or something along those lines. Many are happy to do it. Not me. I know people are busy, and it’s hard to set aside time to read a book. But for me, it is putting words in their mouths and I won’t do it. I ask for endorsements and send the person the pdf and the summary. Then let them write it in their own words. If they don’t finish the book and still write the endorsement then they’ve read enough to feel comfortable adding their name to the cover. I always read the books I endorse. If I don’t have time, I decline the opportunity. Just as I give an honest review, I want to give an honest endorsement. I consider being asked an honor, and I don’t take that lightly. I was appalled to read the words “well-written” by an endorser for a book that wasn’t. It was amateurish and lacked professional editing. Apparently, the individual endorser didn’t read the book. Some writers think readers don’t know what a well-written book looks like, so it doesn’t matter. Oh, but they do. Readers who trust the endorser for an honest assessment will be disappointed if their expectations aren’t met. I’m referring to terms like well-written or excellent wordsmith. Granted we all have our own opinions. If the endorser found it riveting, I may not. That’s different. In our effort to get a well-known person to endorse our work, we may find them more receptive if they don’t have to write the endorsement. Then you have a big name singing your praises on the cover. It may have little to no effect on your sales. Or your sales may skyrocket, but if your words are not well-written, the buyers will not return for your newest release. And if they trusted the endorser and were disappointed, the next book endorsed by the same person may be rejected out of hand by potential readers. There now, the bee has escaped from my bonnet and I feel better. What are your thoughts on getting and giving endorsements? All these differences create a new Super world. One audiences are captivated by. The ssame applies to getting your novel out to the masses. Take a common storyline and mix it up. DiAnn Mills has lots of strong female characters who are FBI, CIA and Secret Services agents and lots of other typical manly roles. The adventures speed along like Die Hard movies and crash to a dramatic conclusion. My debut historical novel has a rancher who sends for a mail order bride. There are many books with the mail order bride theme. My bride however is a doctor hiding form her past. The rancher is raising an orphan niece and there are characters who aren’t who they claim to be. The mail-order idea has been converted to a more modern setting by several authors with cyber dating, and marriage arrangements for material gain. Every mystery has a problem to solve but the problem and the course of action have limitless possibilities. Some writers like Barndilyn Collins are heavy on research so lots of details educate as well as entertain the reader. While others are sprinkled with humor and dorky characters. Check out Linda W.Yezak’s The Cat Lady’s Secret. Crime novels can be written from any viewpoint even the family pet. We know romance novels always end with a couple finding true love. The journey to happily ever after has to have challenges that lend themselves to lots of “what if” moments. Otherwise its just—boring. What novel have you read lately that surprised you with its delightful twists? Point of view (POV) is always a challenge. I shared in a previous post Manuscript in a box: Print It Out For A Fresh Perspective how I found some interesting booboos. As I read through I noticed I’d skewed POV in a few places. In a scene where we are experiencing everything from Dan’s POV, I wrote his words warmed Isabella’s heart. How would Dan know that? He wouldn’t. Unless I gave him the ability of a mind reader, he wouldn’t know. He might have noticed her smile or a blush. But he can only experience his own warm heart. 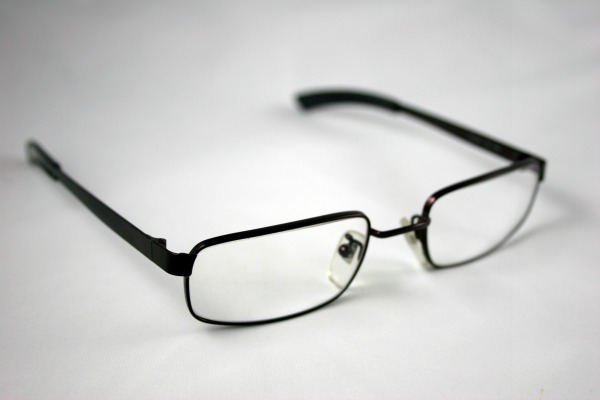 Imagine, as you write, you are wearing camera glasses. You can only write through the eyes of one character. You can’t know the inner thoughts of the other characters in the scene. In Dan’s POV if his words offend Isabella, I need to have her verbalize it or show body language that the reader can experience with Dan. Point of view has more facets beyond staying in your character’s head in dialog. POV takes in setting. Have you ever read a book where the main character is male, but the description of setting through the eyes of this character seemed more feminine? As your character enters a new setting, think about how he might see it. A cowboy might enter a saloon with a different focus than a school marm. Setting is view through a lens distorted by the characters perception and emotions. Let’s put on our camera glasses and look at the saloon from each POV. Tony batted his Stetson on his thigh to release some of the trail dust before placing it back on his head. Passing through the saloon’s swinging doors the piano music invited him to relax after days on the trail. A tiny blond with sultry blue eyes and painted lips swayed toward him. He knew he’d part with some of his wages to steal a few kisses. Tony placed a silver dollar on the bar smiling at the bartender. Tony gulped the watered down whiskey as a rosewater scent surrounded him and a tiny hand touched his arm. Now let’s see how this same setting effects the School Marm. Millie’s heart constricted as she stepped through the swinging doors of the saloon. Curious looks from sweaty, ill-kept men focused on her. A blond woman in a colorful short dress that revealed too much of her womanly form scowled at her. The bartender’s eyes roamed Millie’s form, his droopy mustache straightened with his smile, revealing missing teeth. Millie took a breath to quiet her racing heart only to have her nose assailed by body odor and smoke. Bile rose in her throat. “Sis, you don’t have the stomach for it.” Henry had laughed at her scolding threat. 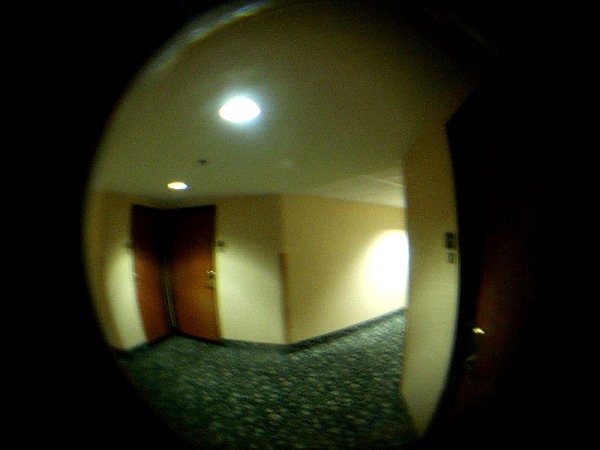 Standing in the doorway her eyes adjusted to the dim light. “We’ll see whose laughing once I get you home.” Anger overtook her timid spirit. Mille spied Henry’s red hair under the familiar straw hat. He hadn’t noticed her yet. His eyes fixed on his cards. She approached the table in the back of the saloon. The piano’s out of tune rendition of Camp Town Races drowned out her quick footfalls on the tobacco stained wooden floor. Notice how each character experienced the room differently. Tony found it a respite from the trail. While Millie saw the worst of the place. When writing a scene think about from whose eyes the reader is viewing the setting. The setting description can be revisited with a different character POV if it gives the reader a better picture of the surroundings and builds the story. Sally adjusted her bodice before descending the stairs. She counted the steps. There were thirty. Each step pulling her down to a job she hated. A job full of shame as red as the velvet curtains hiding the stage where the floor show took place three times a night. On the last step she took a deep breath and pasted on the sultry smile Maggie had taught her. The Rosebud was full of cowboys and gamblers anxious to take their money. Sally needed to work the room tonight. She’d refused to be a part of the floor show which would have netted her an extra fifty cents a night. She was a mother now and her baby lay in his crib with fever. The piano music drowned out his whimpers. Sally surveyed the room and fixed her gaze on a young cowboy not yet inebriated. This saloon had more class than any of the others she’d been unfortunate enough to work in. The bartender loved to look but never touched. Maggie kept a clean house. Maggie’s muscly, tall husband, Francis, watched for offenders and manhandled them out the swinging door before they had a chance to protest. Sally felt safe for the first time in years. Baby Jimmy was cared for by Maggie’s maid when she worked. No patrons were allowed upstairs. If she didn’t earn enough tonight she’d volunteer to help clean after closing. Baby Jimmy needed a doctor’s care. This was no kinda place to raise a child but what other choice did she have. Placing her hand on the cowboy’s shoulder she whispered near his ear. Sally’s POV revealed something we hadn’t expected in a saloon. A place of safety. Now we have three story lines brewing. And three different perspectives of the same setting. Do you have anything you’d like to share about POV? Leave a comment. If you enjoyed this post and would like to receive new posts in your email sign up in the right column. Weirdness was happening on our TV. My husband noticed it first. When I finally heard it, I wasn’t sure I’d heard it. It’s only on certain channels. And less noticeable in cartoons. But during regular programming it is well—weird. While the action is happening a voiceover explains the action. As the characters sat down at a table and during their conversation, a voice interrupts the action to explain they are sitting around a table and opening beers. Then the voice tells us the character Paul has a frown. Then the voice explains Tammy is touching his shoulder after handing him a beer. Then she walks out of the room. Talk about slowing down the action, pulling me out of the story making me want to run away screaming. It took a call to the cable company to solve the mystery. Everyone is probably aware TVs come with the capability of closed caption for the hearing impaired. But did you know there is a language button on your cable box for the sight-impaired? They can listened to the dialog and an explanation of the action. How the language button got activated is still a mystery. 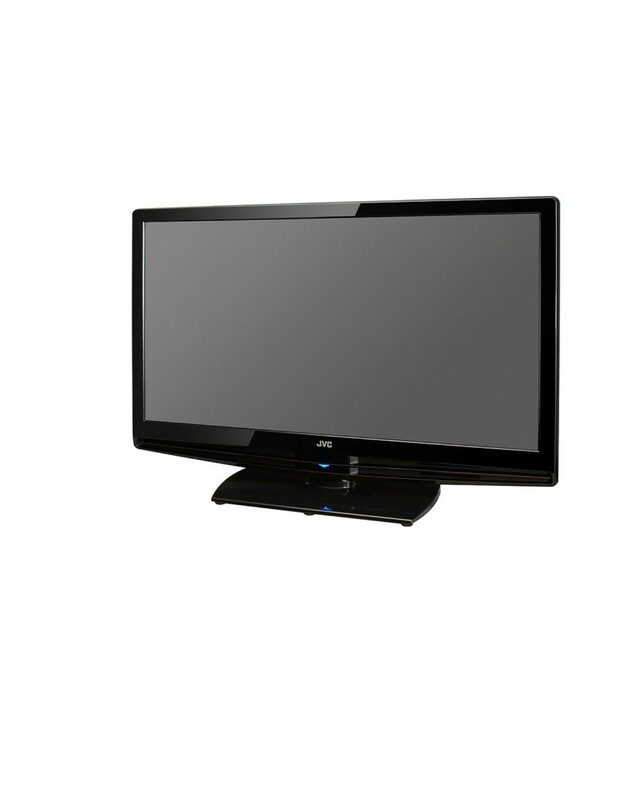 Having the same problem on more than one TV became a mystery for the cable company to solve from their end. But this misadventure is not a total loss. This annoying mishap reminded me of on-the-nose dialog. The kind of dialog …well, let me illustrate. “You look upset, Clara.” Brad remarked. “By your furrowed brow and tapping foot. Not to mention your crossed arms I’d say so.” Brad observed as he neatly arranged her favorite lunch of chicken salad sandwich and tomato soup on her desk. “You are so observant. How well you know me.” Clara added with a glare. Brad placed his hands on her arms and pulled her to him to stop her from tapping her foot and erase the furrowed brow with one of surprise. Clara wrenched his arms away continuing to glare. He thought he was so smart. Well, she’d not have it. “Oh no you don’t. I’ll tap my foot if I want to.” Clara declared. Pretty awful isn’t it. Can you see the on- the-nose writing? Let’s rework this piece to avoid on-the-nose and give us hints into their relationship. I apologize in advance for its lack of polish. I want to show the obvious diffence. So, he it is. Brad noticed Clara’s warpath stance, crossed arms, tapping foot and furrow brow. It screamed get out of my way. Brad sat the lunch sacks on her desk before facing her. “You know me so well.” Clara’s sarcasm had no effect on her assistant. “Are you going to tell me or wear the floor out pacing?” Brad leaned against the desk watching her. Clara made a few more laps before she stopped in front of Brad. Their eyes locked for several seconds before Clara sank into his arms. Muffled sobs wet his shirt. The second grouping tells us so much more about their relationship than the first. And his inner observation is that little voice for the visually impaired telling us what we need to see. On TV where all the actions and facial expressions are seen, the additional information is aggravating. On the nose writing can be just as annoying. The action in a story needs just enough of that little voice to create the scene and place the reader in the moment. Your word picture needs to compliment the dialog and give it a real feel. How often have you caught yourself pausing while reading and saying… “Thanks, Captain Obvious.” You know, when you read “I’m so angry.” She said angrily. On- the -nose writing is so easy to do, and it takes a few read-throughs, usually by others, to catch the more subtle ones. Like my TV, you may need help from the professionals to fix the problem. But once you’ve eliminated it, your words will sound much better. Your readers will embrace your characters as friends and enjoy learning their story. Have you caught any on-the-nose writing in a published novel? Do you find it in your own writing? Please tell me about it in the comments. If you’re interested please click the button on the right to sign up to recieve new posts in your email. This past weekend my brother-in-law passed away. He had been very unwell. My husband felt peaceful at his passing. There were tears as well. Then Charley took the time to pen the following on Facebook. 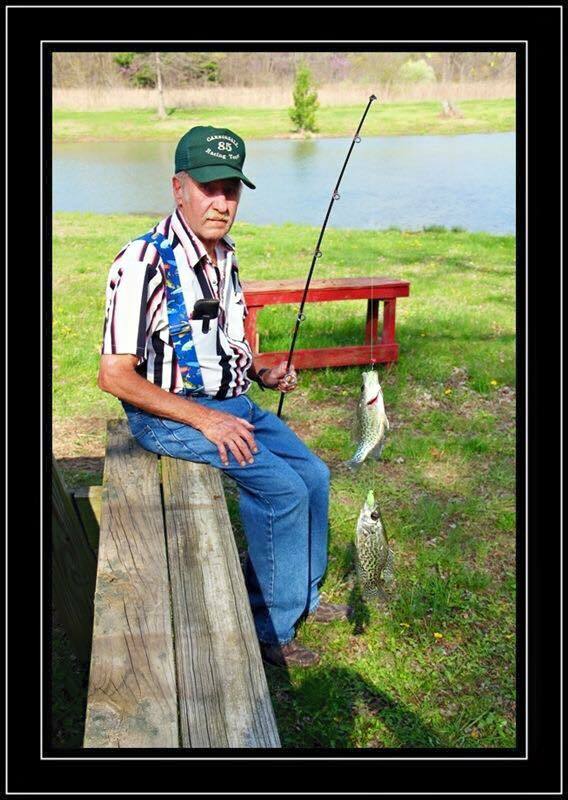 My brother-in-law Kenneth Huff loved to fish. It may never win him a Pulitzer Prize but it does bring healing and closure for him. When my sister died I wrote her eulogy. It was only read to a few people who cared about our family. But it too brought healing. Not everything writers pen sees the light of publication. Our gift of words serves many purposes. In times of loss it ministers to our souls. Even in times of trouble, trials and loss don’t desert your gift of words. Fill your journals with your emotions and memories. Let the grief and anxiety and confusion fill page after page. When I pen my grief I feel a connection with my Heavenly Father that verbal communication can’t reach at this time. My lips may be silent but my heart is full. The grief needs to fall out of me onto paper. Some thoughts and feelings need not be expressed to another human. But my God sees those words and caresses me with understanding. Then as I write my impressions of that caress and the words I hear him whisper into the ear of my soul I find peace. That peace may evolve into something publishable. If not. No matter. The sorrow of others will be easier to empathize with because I have written my secret needs in a letter to my Father in heaven. I know he can carry my friends and family through their grief as well. Write for yourself while you go through tough times. Let your words be the key to your recovery. 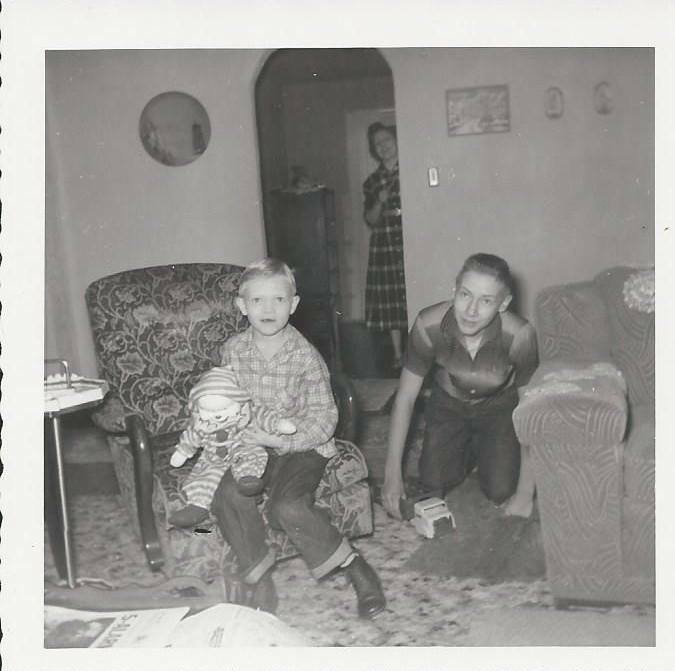 Charley in the foreground with his older brother Kenny a Christmas in the 1950s. Do you use your gift of writing to sooth your own hurts or anxieties? If you like to continue following me click the subscription button on the right column.